All DockerConEU 2017 videos are online now ! 10 Final notes / the end ! The new CEO, Steve Singh, went on stage for the first 30 mn, inspiring the audience with what was done until now and more to come. 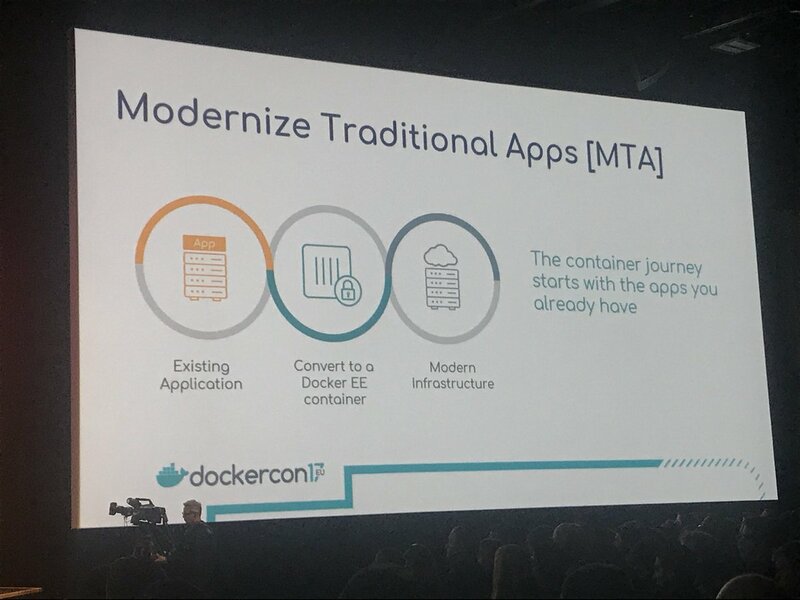 …and MTA (Modernizing Traditional Apps) – MTA was definitely one of the main messages Docker Inc. pushed to the audience during the conference ! 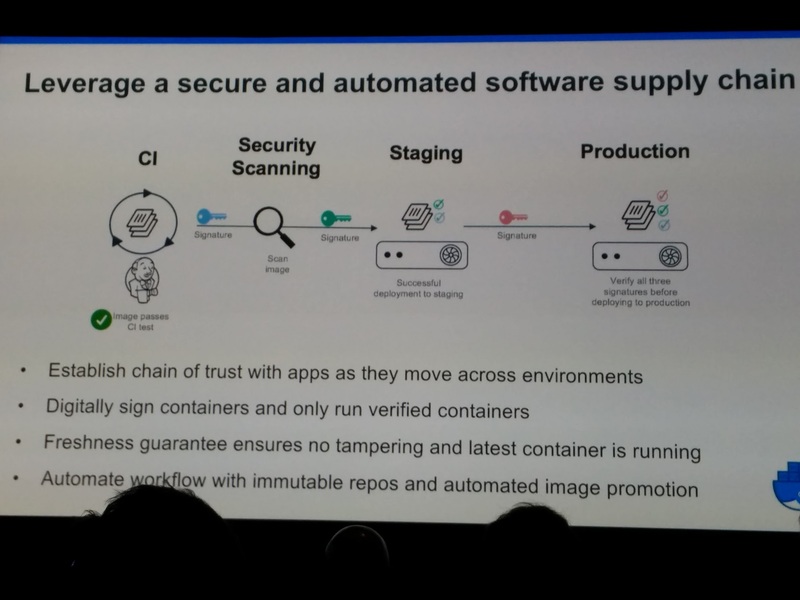 The first demo was about the DAC (Docker App Converter, should be shipping publicly end of 2017) : the engineers on stage converted an old Java War based application into an image deployed to the cloud. 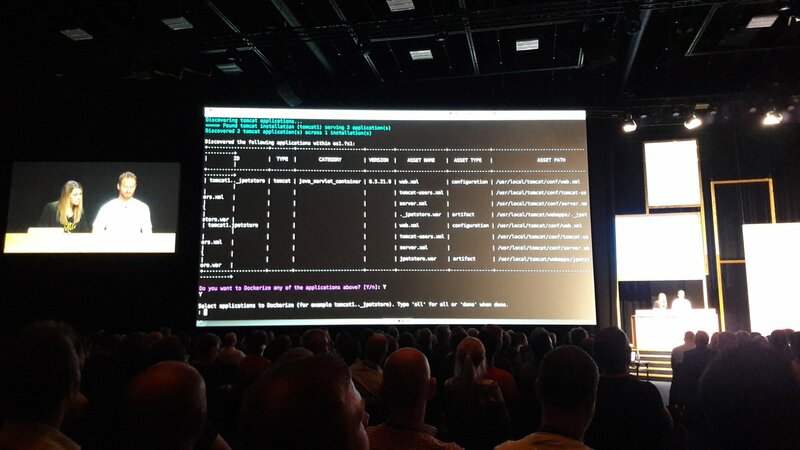 Then a second demo continued the migration of the same Java based application, this time with orchestration, showcasing the Docker EE (UCP / Universal Control Plane) dashboard. The orchestration was based on a Docker compose file, version 3.3, and was using secrets (secured password) and a secured network. Then a senior PM introduced end to end security and enterprise multi tenancy. Then Brendan Burns, Kubernetes co founder working for Microsoft, went on stage and was happy to testify Microsoft is all about integration across platforms. 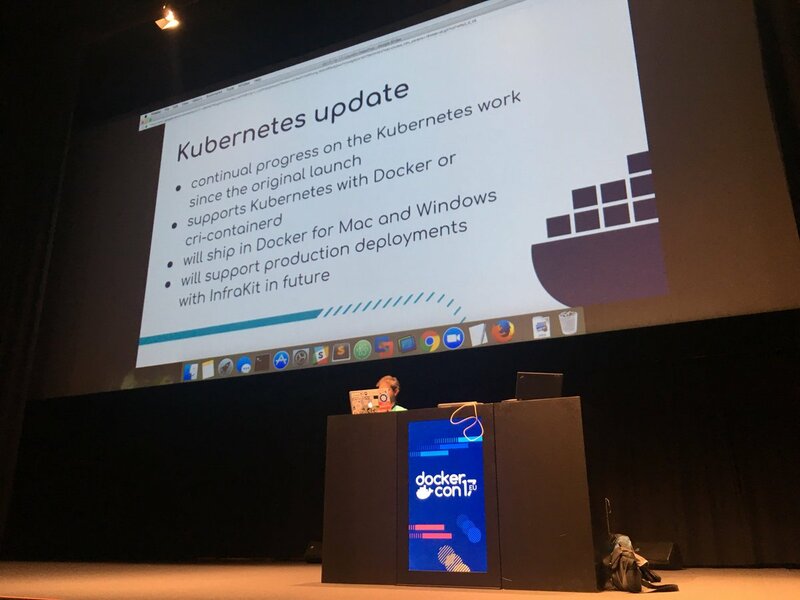 A demo of the Kubernetes integration was given by David Gageot, using docker stack commands to deploy to … a kubernetes cluster !!! 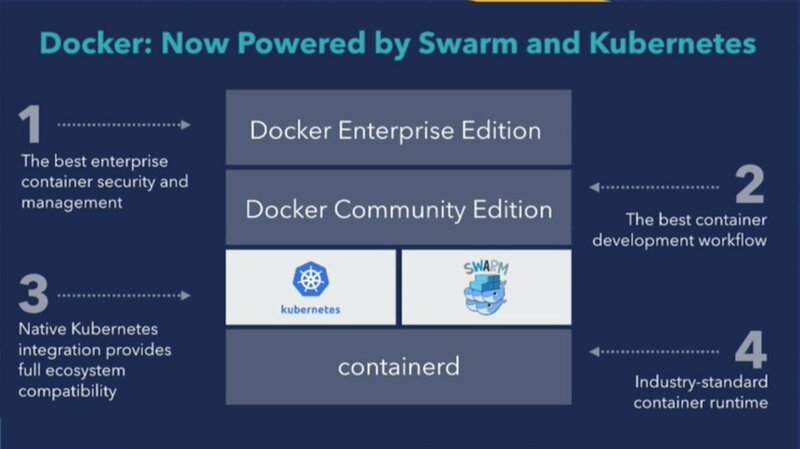 …with of course a demo of the kubernetes support : Kubernetes and Docker working together (kubectl can see Docker swarm nodes and interact with them, and vice versa; Docker EE knows about Kubernetes concepts); Tim Hawkins from Google was on stage to demonstrate that. 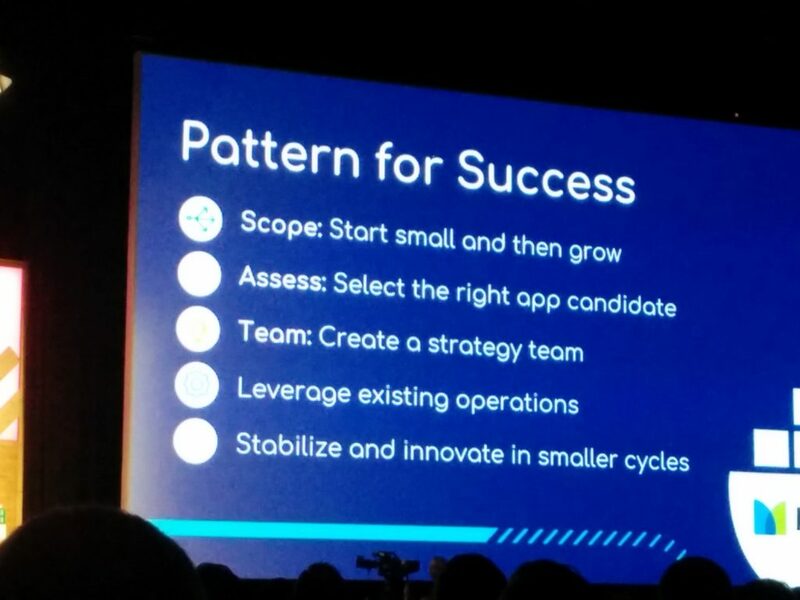 Docker COO put great emphasize on the necessity of fast delivery and MTA. 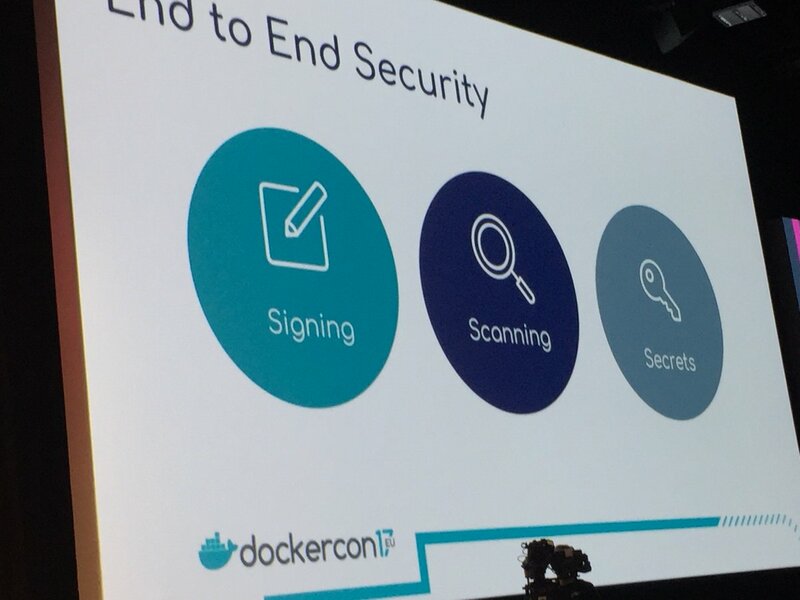 A demo showed a « docker trust sign » command, with the use of a private key password; Docker ee allows you to only run / deploy signed images by a certain group. 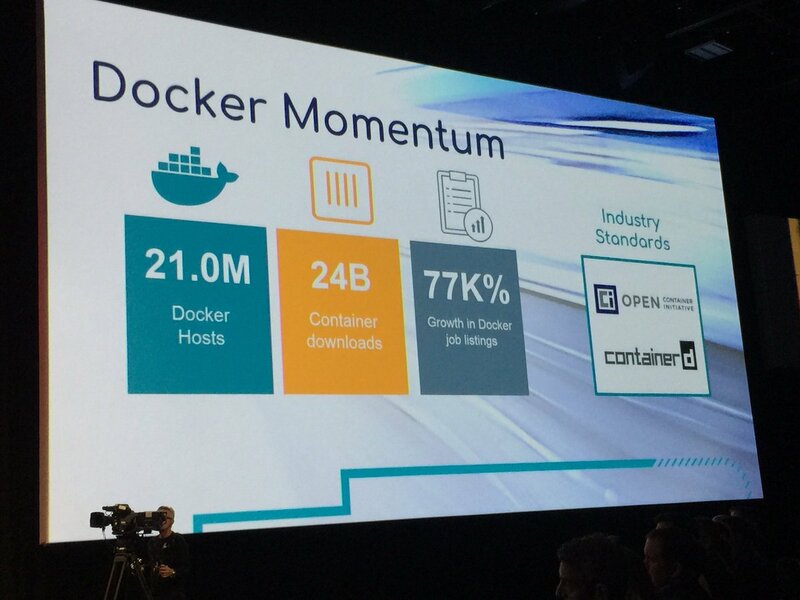 All the session was centered around MTA, and Docker partnerships (consultants and customers and cloud providers) – nothing technically interesting there. No doubt, this was one of my favorite sessions : this tool, http://labs.play-with-docker.com/ or PWD for the intimates, is really a gem ! 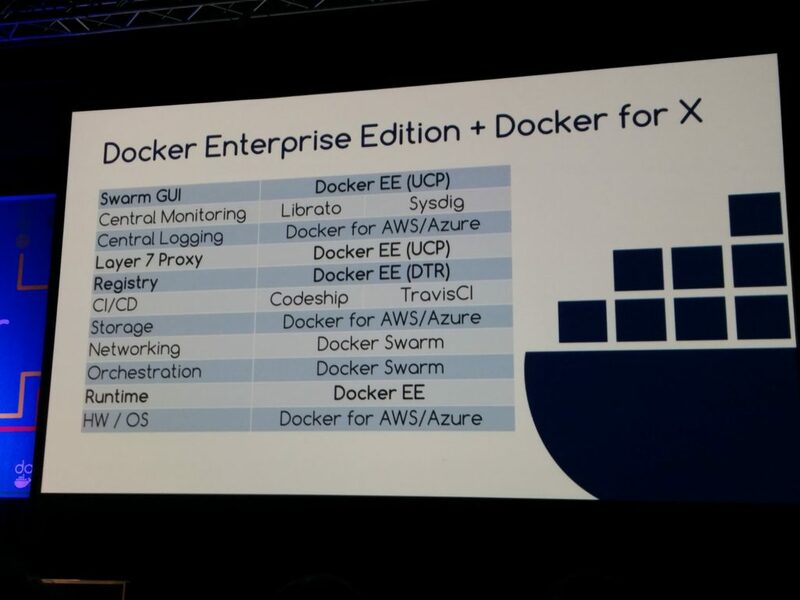 It runs Docker, even Docker Swarm, on shared Azure instances, via Docker In Docker (dind) – it allows anonymous people on the web to play with Docker. User session is coming: no more captchas, you will be able to auth. 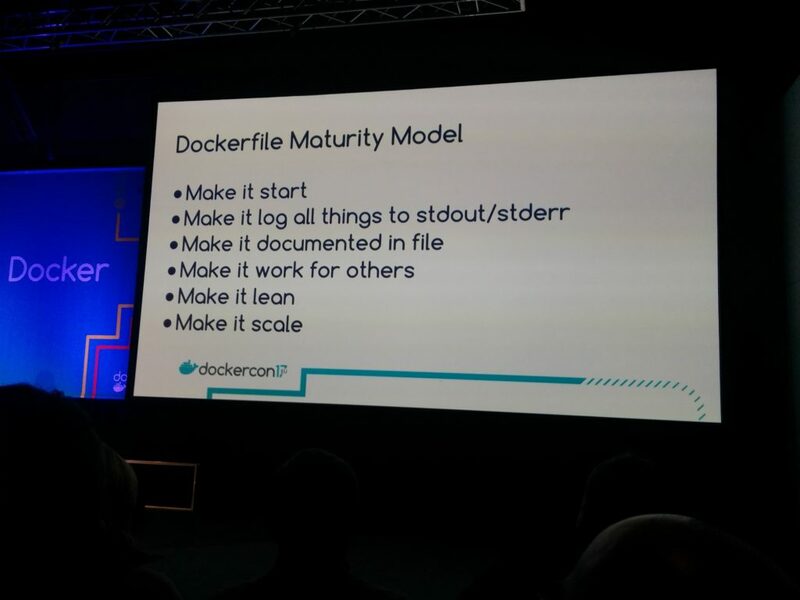 with dockerid to keep your progress with labs. 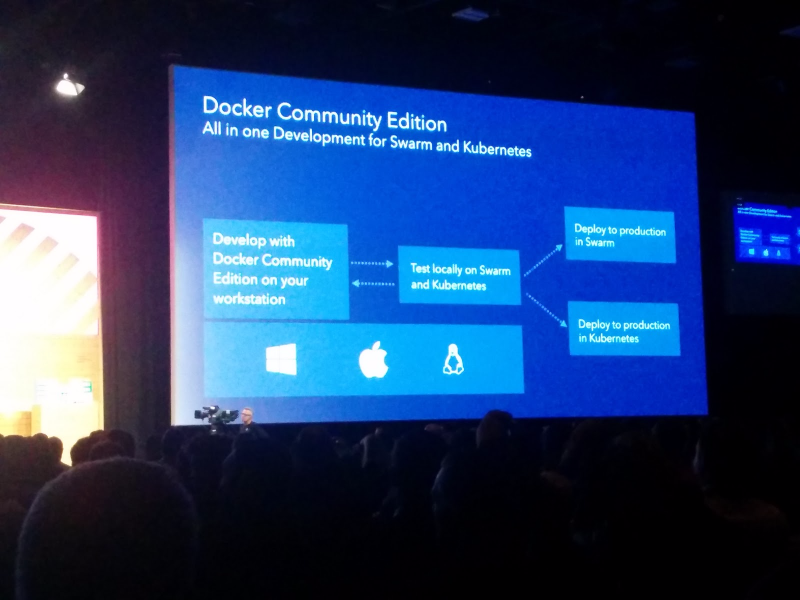 Windows containers were also introduced recently, providing the same experience. The first challenge was about networking : first attempt with vpn, but it was hard to deal with windows VMs, so problem was solved on the linux hosts via iptables routing. Second challenge was with the terminal : attempts with windows powershell and windows ssh, but ended up using nodejs pty because of slowness. 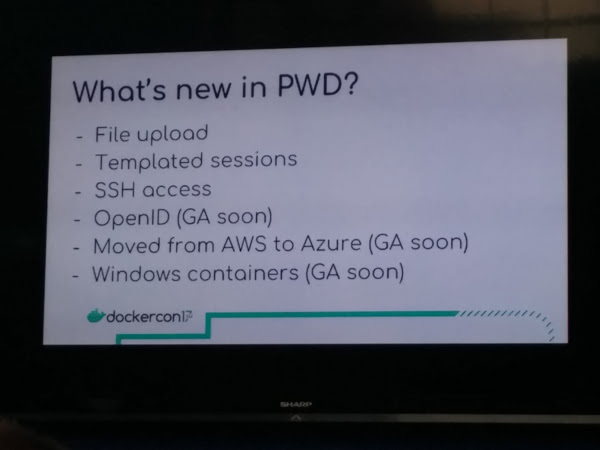 Public PWD is coming to other regions (currently west North America I believe), and alibaba cloud too. It’s open source too : github.com/play-with-docker to run on your organization infrastructure. Talking with the two presenters, I asked them if it was « secure » to login to his / her own docker account to pull private images (on dockerhub / or any other registry) from PWD; and they replied to me they would not recommend me to use the docker login directly in the browser, but that connecting through ssh and doing the docker login from my laptop would be safer, since my password would never be stored or known by PWD (just a token, so still a security risk). Your best security bet with PWD ? hosting it yourself, it’s open source ! LinuxKit is a toolkit for building secure, portable and lean OSes for containers. What’s new ? 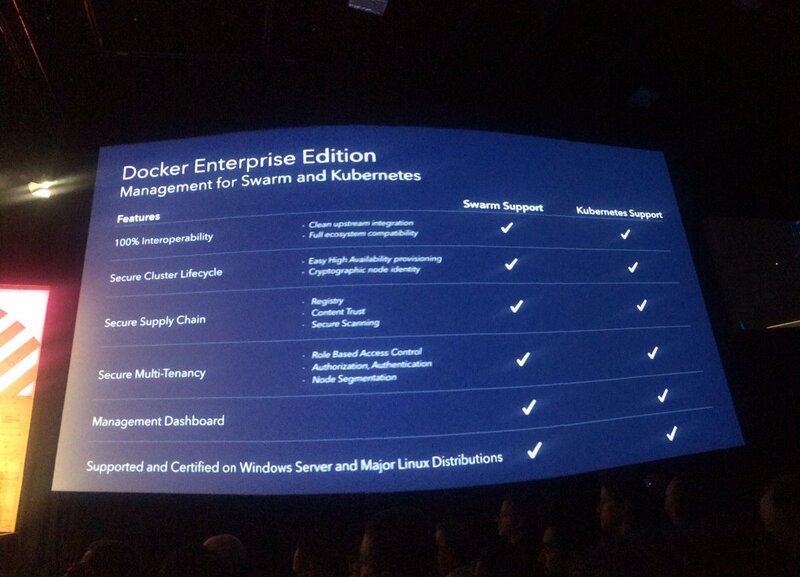 arm64 support, Kubernetes support, Linux Containers on Windows, and improved platform support. 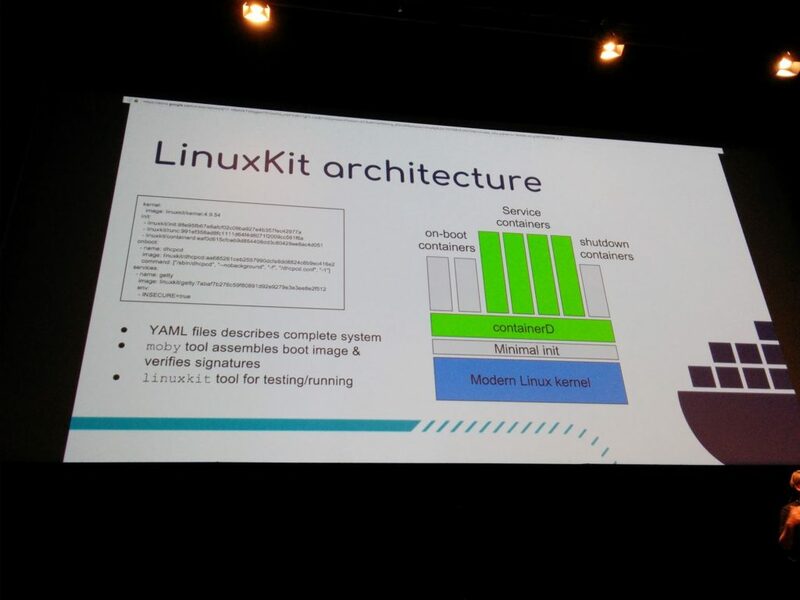 During a demo Rolf built a linuxkit on x86_64, an arm64 server and a Raspberry PI3 using the same yaml build file and the same command line « moby build ». Then he booted them using the linuxkit command. Linuxkit base images are based on alpine and add several packages such as compilers, dhcp clients, etc. All the binaries will be run in containers with the minimum required kernel capabilities, to reduce the attack surface. Finally, he introduced Wireguard : it’s a fast modern VPN included in linuxkit, that appears as a network interface, and allows you to pipe traffic into a secured channel. Not exactly a technical session, but a fun and refreshing one : Ashley is a photographer who became software developer at age 32. She then created a popular Github page for developer resources. Thanks to Steve Francia, she learned Go and gave several workshops about Go since then. Ashley recommends people to not learn all alone, but to go out and find help. The best project to contribute to is the one you’re already using. She created gopherize.me ,the gophers repo (cute Go pictures) on GitHub. 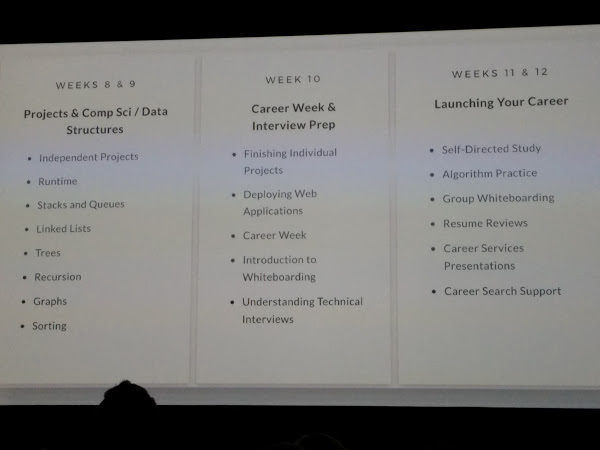 She recommends developers to work with community (stack overflow, blog posts, open / close tickets and contributiion to docs). 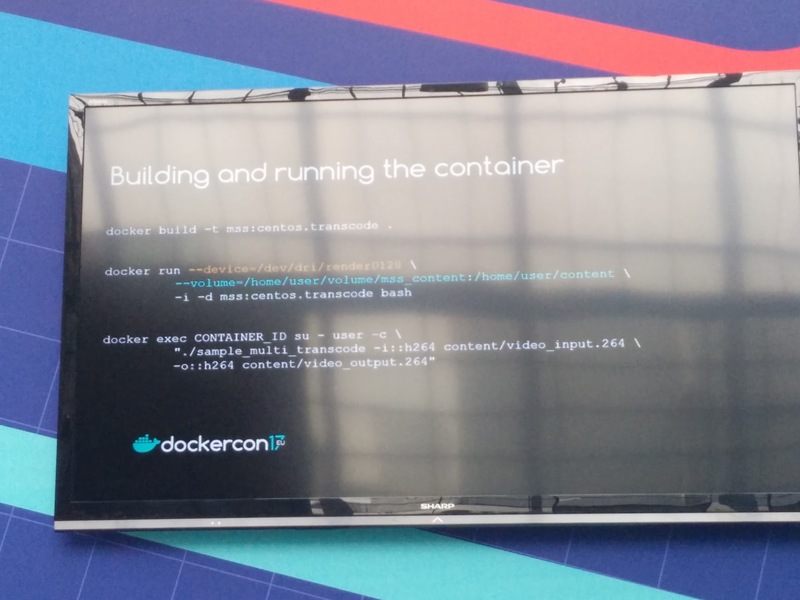 For the demo, they used a lab : https://dockersamples.github.io/dceu-labs/java-mta/ ; it’s pretty cool to follow through, it’s based on Play With Docker, no need to install anything on your machine, it’s only going to take you 10mn of your time, I highly recommend this lab ! 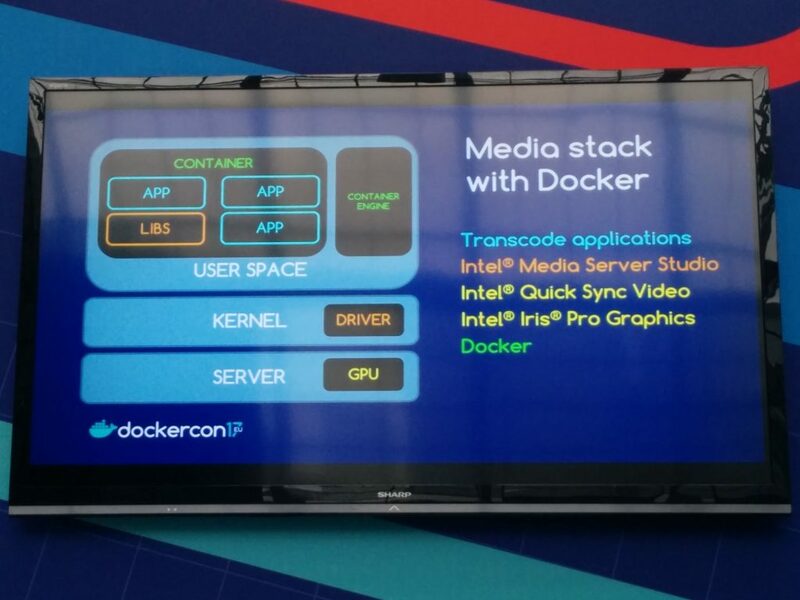 The container will have dependencies on the hardware and kernel modules; the speaker considered running several media stack apps in the same container or just one (preferred container deployment pattern), but the performance impact was negligible. 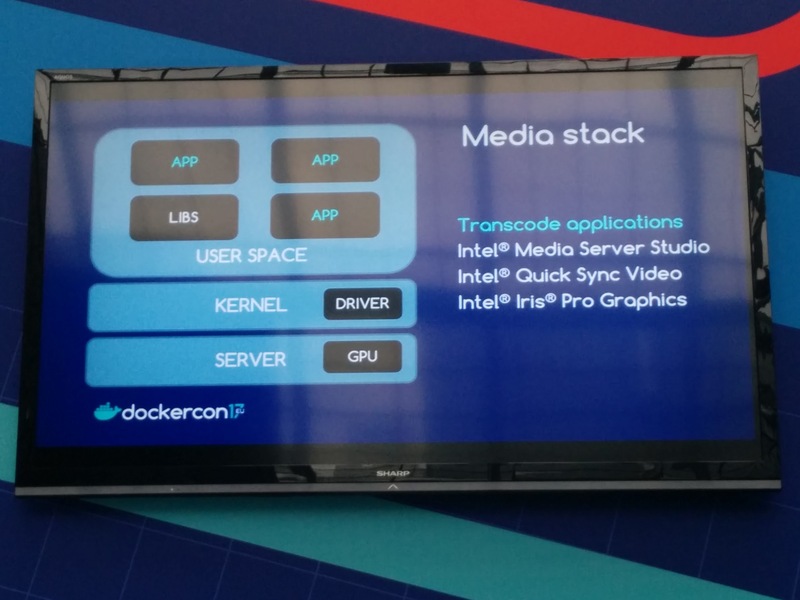 Your orchestration tool could understand hardware requirements; so could be worth it to use docker compose files to deploy the media stack. 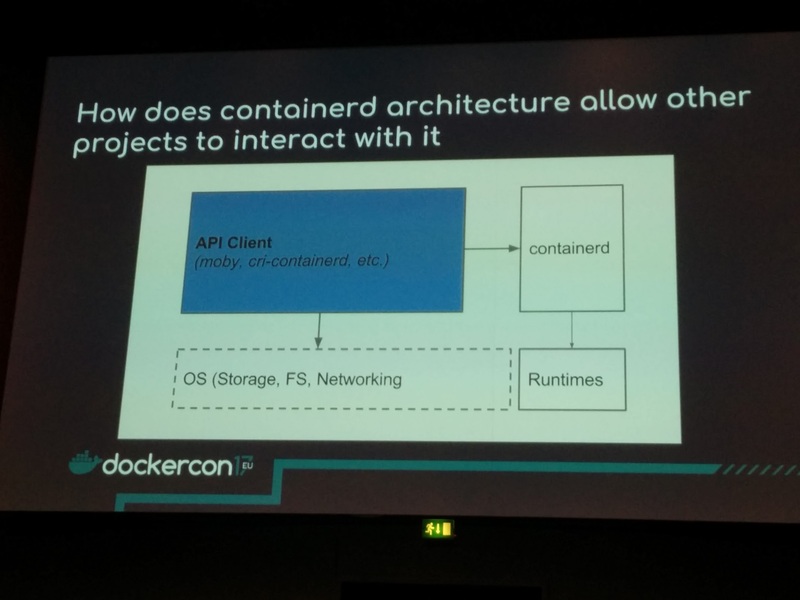 The container CLI (ctr) communicates with a daemon exposing a gRPC API over a unix sock and protobuffs. 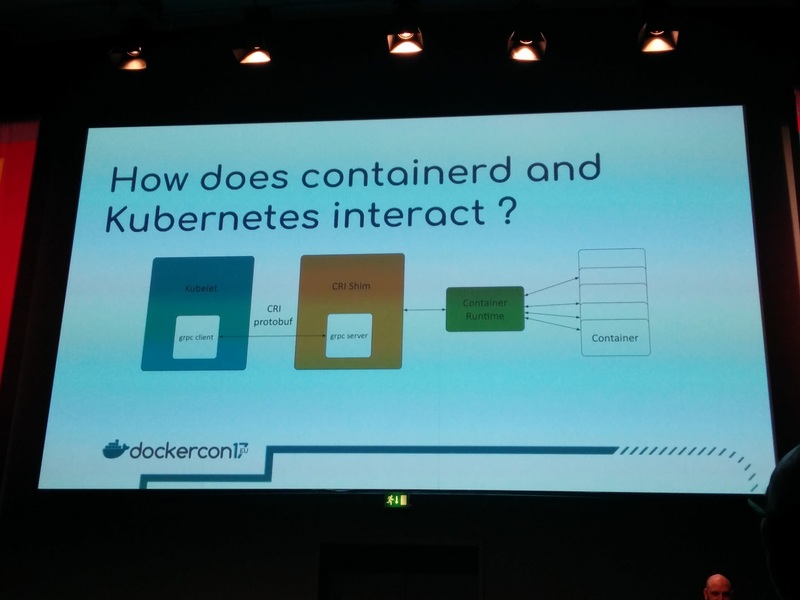 Who uses containerd ? 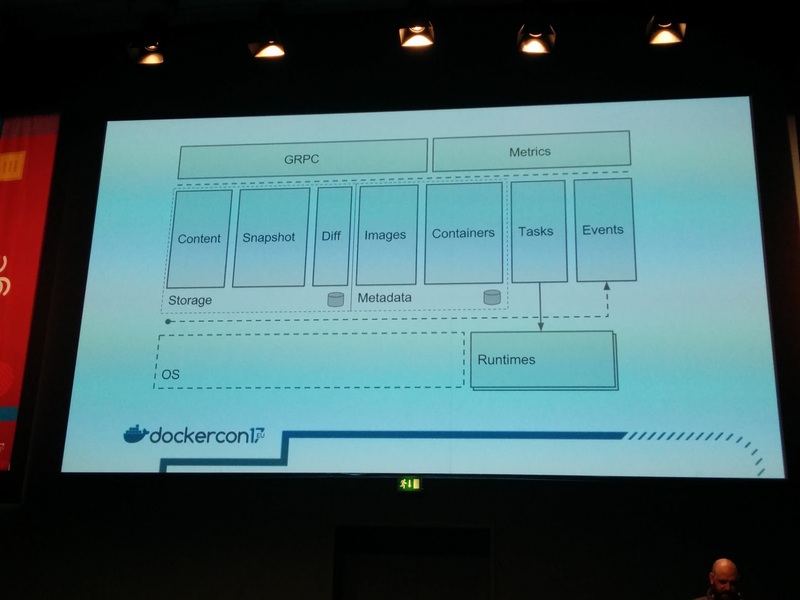 The Moby Project: the docker engine, swarmkit, hyperkit, runc, linuxkit plug into containerd. The speaker then talked about linuxkit : it’s a lean , minimal size OS. At Puppet, they made sure to only ship necessary packages in their linux image built from linuxkit. linuxkit is also immutable, and its init is very basic : initd, runc, containerd and certificates are the only additional packages added to the linux image. What about kubernetes ? how does it interact with kubernetes ? This talk was very well attended (200+ people) and pretty entertaining, thanks to a quizz on 80’ies video games being run along the talk, nice idea ! 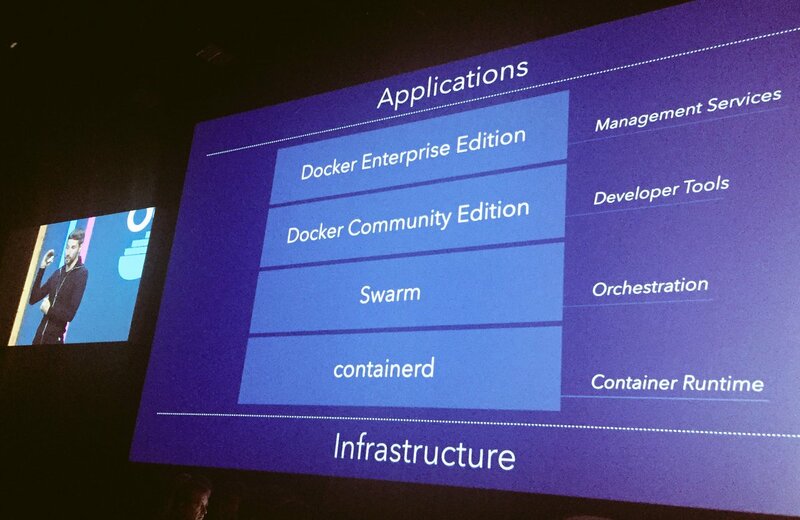 Brett basically told the audience to be pragmatic when Modernizing Traditional Apps (MTA) to Docker. don’t leave the default config, use one with sane settings for a container run. Where to deploy ? VM or bare metal ? As you wish – choose what you’re most comfortable with. The Linux distribution of your host does not matter that much; but make sure to use most recent kernels. Not sure ? Ubuntu 16.04LTS , popular very well tested with Docker, wide storage driver support. Or build your own linuxkit ! Don’t turn cattle into pets : there should be no special container (meaning you should not have containers that can’t be replaced without affecting the system). You could also consider having just 1 container per VM, at least to start and explore how your software behaves. Final notes / the end ! 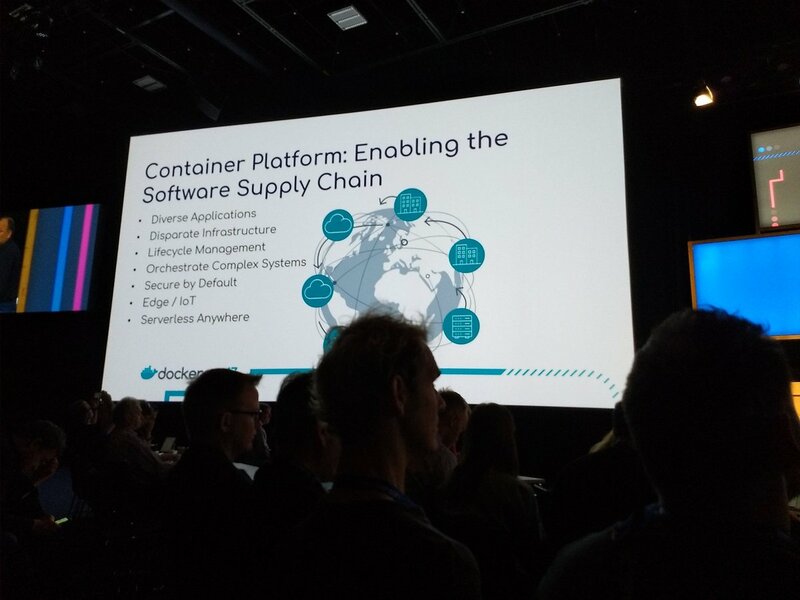 We were a few SoftwareAG employees also running a booth there, it was interesting to meet SoftwareAG products users (Adabas, Aris, Apama, etc, and Terracotta Ehcache of course) currently working on containerization; we also celebrated the launch of several of our products on DockerStore, check them out ! thanks Anthony, appreciate the cogent summary..